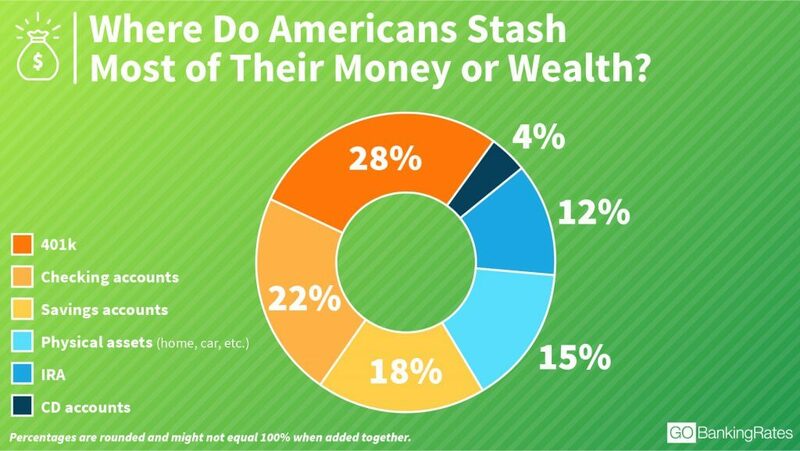 Survey uncovers where Americans are stashing their wealth. Many Americans lack sufficient savings in their savings accounts, according to GOBankingRates’ annual savings survey. For the third year in a row, more than half of Americans reported having less than $1,000 in savings, with 39 percent stating they have $0 saved in 2017. Click through to see how much Americans have in savings in every state. There could be various reasons why Americans aren’t saving more money, from bad money habits to dealing with a high cost of living. However, there’s another possibility that’s often overlooked: Perhaps Americans are veering away from traditional savings accounts and choosing to save the majority of their wealth somewhere else, such as checking accounts or retirement accounts. To find out where people are primarily saving their money and growing their wealth, GOBankingRates conducted another survey. Keep reading to learn how many Americans are storing their money today, and discover the best saving vehicles for you. More Americans store their wealth in 401ks than any other sort of account, fund or investment, found the survey. Of those surveyed, 28 percent said they store the majority of their wealth in a 401k. The next most common answers were “checking account” and “savings account,” with 22 percent and 18 percent of respondents choosing these choices, respectively. Survey Question #1: Where do you store the majority of your wealth or money? The study also found that the amount of money people have stored depends on where they store it. For example, the majority of Americans who store most of their wealth in 401ks, IRAs and physical assets have $60,000 or more saved in their option of choice. Meanwhile, the majority of respondents who store most of their wealth in CD accounts, checking accounts and savings accounts typically have less than $1,000 stored. Survey Question #2: How much money do you have stored in that account? Even though the majority of Americans keep their wealth in 401ks, the number varies according to gender. Nearly 31 percent of male respondents store the majority of their wealth in 401ks, while only 24 percent of women respondents do. Where do you store the majority of your wealth or money? Age also plays a role in where Americans stash their cash. 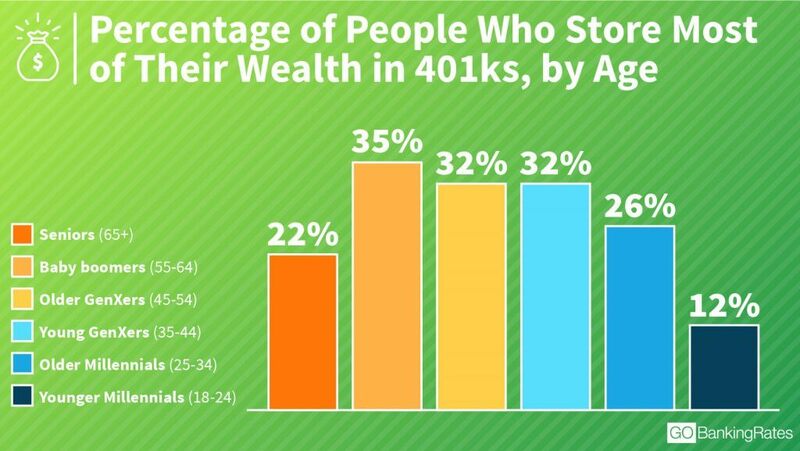 The youngest and oldest respondents are the least likely to have their wealth stored in 401ks, with 12 percent of young millennials (age 18 to 24) and 22 percent of seniors (age 65 and older) stating the majority of their wealth is in this type of retirement account. Baby boomers (age 55 to 64) are most likely to have their wealth stored in a 401k, with 35 percent of respondents in that age range choosing that option. Younger respondents store most of their wealth in checking accounts, while those 65 and older spread their wealth out more across the various savings accounts and investments. GOBankingRates’ 2017 Retirement Savings survey found that more than half of Americans will retire broke, with 34 percent stating they have no retirement savings at all. However, this more recent survey seems to indicate that those who do save tend to prioritize retirement savings over traditional savings. The reasoning for this might be because saving for retirement can be easier. Typically, retirement savings are deducted from a paycheck automatically and put into a 401k, which means the saver doesn’t have to do much work. On the other hand, putting money in a traditional savings account usually requires an extra step (unless you set up automatic deposits and transfers). Compare: How Do Your Finances Measure Up to the Typical American’s? Are Checking Accounts Becoming the New Savings Accounts? 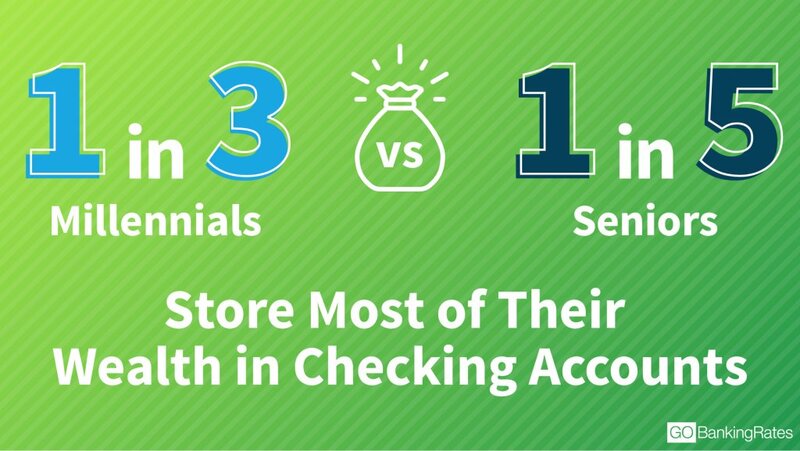 Although 401ks are the more common vehicles for storing wealth, checking accounts have become the second most popular place to keep money. Traditional savings accounts come in third. Checking accounts are especially more popular among younger age groups. This survey found millennials are the most likely to store their wealth in a checking account, with about 36 percent of those 18 to 24 and 29 percent of those 25 to 34 choosing this option. Meanwhile, about 19 percent of seniors (ages 65 and up) reported storing the majority of their wealth in checking accounts. This could be because older generations are more focused on preparing for their impending retirement, so they put their wealth into 401k plans, while millennials are more focused on taking care of day-to-day living expenses. A previous GOBankingRates study found that the majority of millennials currently do not have enough money saved to cover six months of living expenses, with most young millennials living paycheck to paycheck. With no extra money to contribute toward savings, it makes sense that millennials would put their earnings directly into a checking account to cover day-to-day expenses. Where Should You Be Storing Your Wealth? Each option for storing wealth comes with its own set of advantages and disadvantages. Depending on your financial situation, you might want to spread your wealth over multiple accounts. Or, you might want to stick with a few. Putting money into a savings account lets you accrue interest on the wealth you store. The best savings accounts of 2018 have higher interest rates and low fees. However, interest rates on savings accounts are still low. And, some accounts have monthly fees and minimum balance requirements. With interest rates offered by banks declining, it has become more tempting to forego savings accounts altogether in favor of keeping wealth in checking accounts. “Interest rates are at historic lows, and many banks’ savings accounts don’t pay much more than checking,” said Michael Dinich, a retirement and tax planner at Your Money Matters. A checking account lets you easily access your funds to pay for bills and other purchases. The best checking accounts of 2018 pay interest on your funds, offer free checking or have low account fees. However, there are drawbacks to using checking accounts as your main savings option. Dinich pointed out many banks now charge for checks and assessing monthly fees. But most alarming is the fact that funding a checking account and ignoring a savings account could make you more vulnerable to theft. A certificate of deposit, or CD, is a deposit account that requires you to wait a fixed amount of time before withdrawing funds. If you choose to withdraw earlier, you will be assessed a penalty fee. Although CDs don’t offer the same flexibility as checking and savings accounts, the interest accrued is typically higher. In fact, the best CD accounts have high interest rates and a range of CD options, including different term lengths and rate-increase features. Putting the majority of your wealth in a 401k has several benefits, one of which being its convenience. However, 401ks come with less flexibility than other investment plans, so you might not accrue as much in a 401k as with an account that offers more investment options. An individual retirement account, or IRA, is a retirement account you can open on your own without employer sponsorship. Most IRA options let you contribute money before taxes are withdrawn. With an IRA, you can save for retirement if your employer does not offer a 401k or pension plan. And, contributing to an IRA reduces your taxable income. To qualify for an IRA, applicants must meet income requirements, and contributions are capped. Physical assets can include homes, collectibles and vehicles. Investing in the right asset can boost your net worth. But keep in mind that maintaining an asset, such as an expensive car, can end up costing more than it’s worth. And, some asset values — like a car — can depreciate over time. Plus, you can’t immediately access funds from an asset. No matter where you store your wealth, it’s important that you have savings set aside for unforeseen expenses and emergencies. Financial experts recommend having enough funds saved and accessible to cover six months’ worth of expenses. Even if that’s not a financially viable option, make saving money a habit now to be prepared for whatever comes your way in the future. Preparing for retirement in your 50s doesn't have to be hard.